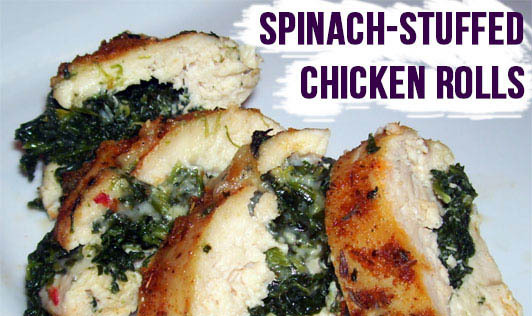 Spinach stuffed chicken rolls is a simple dish guaranteed to make your boring meal interesting. Flatten the chicken breasts with a rolling pin, marinate in salt, pepper, and olive oil and keep aside. Heat a teaspoon of oil in a pan, add the garlic and onions, cook for 5 minutes, add tomatoes and spinach and cook until done. Divide the spinach into 4 equal portions. Stuff the spinach in the chicken, top it with cheese and paneer. Season with salt and pepper. Roll the chicken up and hold it together with a tooth pick. Apply a little olive oil on a baking dish and roast the chicken till it turns brown on the top and is evenly cooked through.